Transit referendum: A question that should never have been asked? It was a plebiscite the mayors didn’t ask for and a vote they didn’t even want. But in the end it’s the mayors’ council that was left trying to explain a resounding no vote against a tax increase in Metro Vancouver. It was a plebiscite the mayors didn't ask for. A vote they didn't even want. 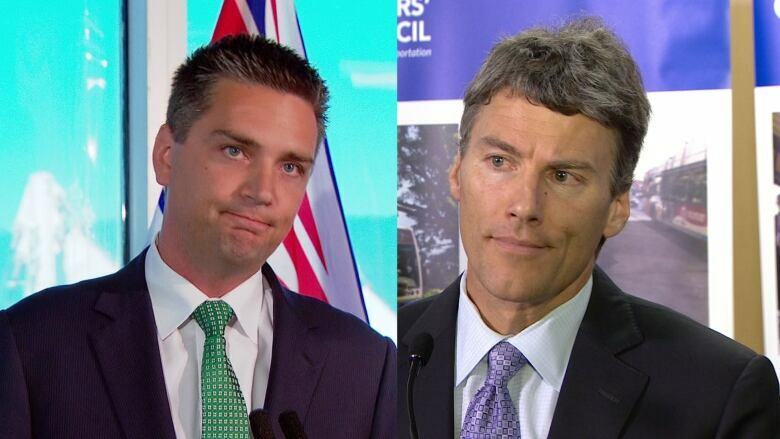 But in the end, it was the mayors' council, led by Vancouver Mayor Gregor Robertson, that was left trying to explain a resounding No vote against a tax increase in Metro Vancouver. "There are not a lot of options here," said Robertson at a press conference after release of the plebiscite results on Thursday. Who will pay for improvements now? "The mayors have historically been united in not approving a referendum as a process for infrastructure funding like transit and transportation investments," he said. "We stated that very clearly to the province. We did not want to see this process as way to approve transportation funding." But the province moved forward with it anyway. The province had already committed to cover $2.5 billion of the mayors' council plan to improve transit in the region. The federal government has indicated it will provide its share. This transit plebiscite was all about finding a way to cover the remaining third. Voter turnout was just below 50 per cent — better than most municipalities saw in last fall's local elections. Transportation Minister Todd Stone couldn't take the smile off his face for promising to bring the issue to a vote and then executing it. "It turns out a lot of people had something to say about this," Stone said when he spoke to the media on Thursday. But was it a question that should have ever been asked in the first place? When Stone was asked how having a referendum on transportation investment was any different than a vote to approve hospitals or schools, he brushed off the premise of the query. "We did have an election, and we did propose a good number of the hospital expansions and the investments in education," he said. "We put all that in front of the electorate in the last election as well and received an endorsement on that plan." Municipalities have few options when it comes to securing funding. That is why it doesn't seem that this will be the last referendum the province sees on this issue. In a letter sent to B.C. Liberal supporters and signed by party director Laura Miller, the future seems clear. "They [the mayors council] can look ahead to 2018 [as] the next time they'll be able to bring something forward to their electorate," the letter said. NDP Leader John Horgan has a very different opinion on how referendums should be used for funding decisions. "I think this is a slippery slope for us here in British Columbia. Our tradition and the British parliamentary tradition is that governments make decisions and if the public doesn't like the decision, you throw them out," said Horgan. It becomes even dicier when the government picks and chooses what issues it brings to the public. There was no referendum when it came to deciding to replace the Massey Tunnel, which connects Richmond and Delta under the Fraser River, with a bridge, a project that is estimated to cost about $3 billion. University of British Columbia political scientist and PhD candidate David Moscrop said cherry picking what issues go to the public is bad public policy. "The premier chose the coward's way out," said Moscrop. "She (B.C. Premier Christy Clark) made a promise when she was behind. She knew transit was necessary and must have known it was a hard fight." Bringing complicated issues such as transit funding to a referendum is challenging, Moscrop added, because in most cases, people who don't use transit would never vote for a tax increase to pay for something they wouldn't use. Voters typically pick candidates in elections they believe best serve their own interests. "We expect representatives to use their judgment," he said. "On significant constitutional matters, it makes sense.… Are we going to have a referendum now on every infrastructure project?" There is also the matter of how long the electorate has to understand the issue. The transit referendum spanned about six months. There have been examples in the United States where campaigns like this have unfolded over two years. So now that the campaign is over, the finger pointing will continue, as will the debate about how transit will be paid for in the future. One thing is sure, however. If the B.C. Liberals win the 2017 provincial election, expect British Columbians to have this debate all over again. Transit referendum: How did your city vote? Transit referendum: Who will pay for transportation improvements now?